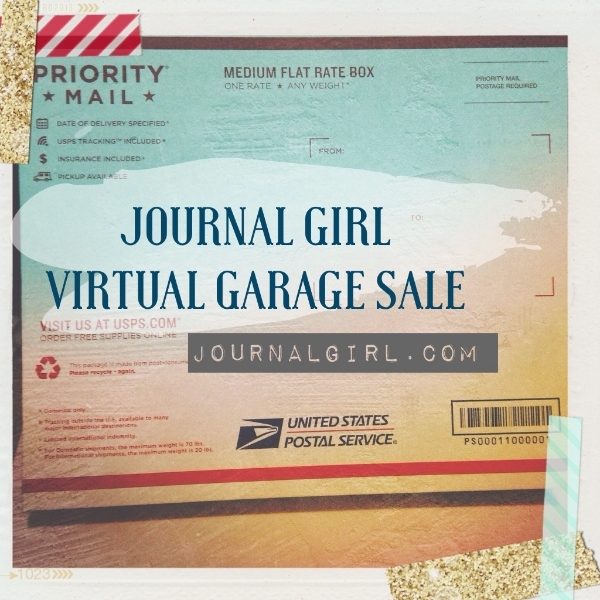 with a full soul -- the journal girl virtual garage sale! I'm a pretty exhausted girl! Getting this virtual garage sale ready took a lot more work than I thought it would, and I'm STILL finding things I could put on my digital blanket on the yard, but then I would never stop and the lawn would be too cluttered and people wouldn't be able to see what they like! Oh, a song just came on random and is my You Can Do This super inspiration song. Thank you God for such serendipity! Can I just say that I really love all of you? If you're reading this, these words on a screen on the floor of my half-packed bedroom, my hair in a no-nonsense ponytail that swishes over my shoulder, anyway, I love you. I appreciate you. All the little likes and comments and virtual hugs. The past few months have been full of so much pain & frustration for me...having to stay in bed for weeks, or my hands too swollen to draw or paint. I know how amazingly lucky I am to be able to make a little living off my art, that others actually like -- no, love -my work enough to commission paintings or buy big ones and little ones. Let me tell you a secret -- bed rest is boring. But I shared my experience, and continue to do so as I start physical therapy. And all those little clicked red hearts or short messages meant the world to me. You were my connection to what is outside the room, that life still thrives and dreams and dares. I haven't felt very brave lately, but YOU have helped me build the courage to do all this. There's a whole story about that journal page above that I have yet to type out, but that'll have to wait. For now, know this -- I have truly experienced what it feels like to have a full soul. To be peace and gratitude and just...wow. I don't know if you've had one, but it shifts something in your heart. Mine has been so protected for so long, it had forgotten some stuff. But I know that there's so much love in the world, and I can give it freely, so I give it to YOU. Now for the main event!!! It's garage sale time! I have packed 10 medium flat rate boxes with TONS of supplies, papers, markers, pens, punches, stencils, spray inks...if you've seen me use it, there's probably some of it in there. These suckers are heavy with juicy good supplies and want to come to your house. I have also stuffed 10 baggies with awesome found papers and gelli printed papers and yummy stuff, too! How about a big collection of awesome art and crafting books that won't be able to come with me to my new home? Or some older paintings that want to live on your walls? Just head on over to the virtual garage sale page to look at all the awesome stuff I've put together for you! Wait! There's one more thing! My beautiful, lovely laptop has finally died, meaning I'm working off a borrowed computer or my iPhone most of the time. While this is okay for now, when I move, I won't have the luxury of using someone else's laptop, and need a little help raising funds to fix or replace mine. I've set up a donation page where you can donate directly & get a love letter, or pay-what-you-can for all my current workshops. You can head on over to the Studio Fireflies page to help me out or sign up for a class. I'm really excited about writing love letters.